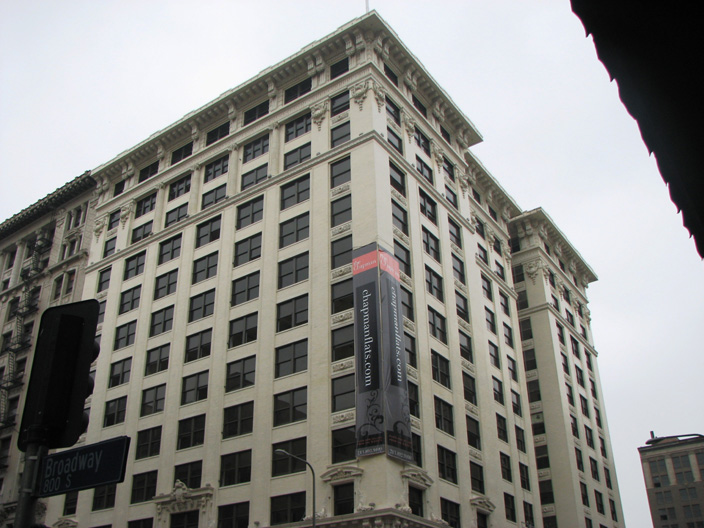 This 13-story Beaux Arts building was one of the earliest major steel frame office buildings to be built in Los Angeles. Built by the Los Angeles Investment Company, a major landowner and housing developer in the early 20th century Los Angeles area, the building was designed by Ernest McConnell, who was the in-house architect for the company. Besides the Chapman Building and several other historic downtown buildings he did for the LAIC, McConnell designed dozens of Craftsman homes that were published in a plan book produced by the LAIC. Many of these homes were also built by the LAIC in the various housing subdivisions that they created in the Southern California area. A financial problem in the mid-teens forced the sale of the building to Charles C. Chapman, a wealthy rancher and capitalist from Fullerton. Originally hailing from Chicago, Chapman had made a fortune in the printing and construction business before coming to California in 1894 for his wife’s health. He soon became involved with the citrus industry and is credited as the “father of the Valencia Orange.” He was also the founder of Chapman College in Orange County and the first mayor of the city of Fullerton. Shortly after buying the building, Chapman became one of the founders and first board chairman of Bank of America, which was headquartered in the Charles C. Chapman Building. When A. P. Giannini’s Bank of Italy later bought out Bank of America, he was so impressed with the solid reputation that Chapman had built for it that he opted to retain the name of Chapman’s bank, which today is one of the largest financial institutions in the world.